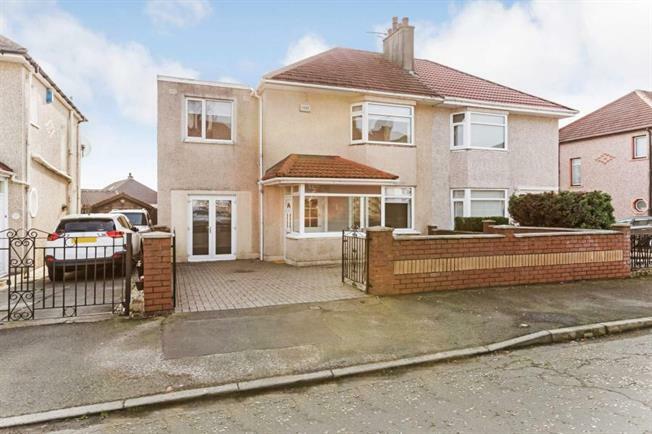 4 Bedroom Semi Detached House For Sale in Glasgow for Offers Over £180,000. Immediate internal viewing is of paramount importance to fully appreciate this truly stunning extended and converted Henry Boot built semi detached villa which offers unrivalled family accommodation throughout. The property comprises entrance porch, bay window living room, extended family room with French doors to front, extended dining/tv room with access to rear garden, fitted kitchen, upper landing, four good sized bedrooms (master en suite cloaks wc), floored and lined loft with velux window via pull down ladder and fully tiled family bathroom with free standing bath and separate shower enclosure. The property benefits from gas central heating, UPVC double glazing, monobloc parking facilities and fully enclosed landscaped garden grounds to rear offering large paved area leading to two timber decked areas. The property benefits from monobloc parking facilities and fully enclosed landscaped garden grounds to rear offering large paved area leading to two timber decked areas. Immediate internal viewing will surely impress.